Spring is here and all of our purebred Alpine does are pregnant! They are expected to kid at the end of April, so we are taking reservations for their kids now. We are offering these kids as “bottle babies” so that they will have the most opportunity to bond with you on your farm/homestead and become extremely friendly toward people. In addition to the purebred Alpines, we also have bred two of our Alpine does with our Nigerian Dwarf buck (“Champ“), to produce wonderful mini-Alpines! We will be working on a first-come, first-served basis for reservations. So even if you are just considering goats, send us an email so you can get the best place on our reservation list. If you have questions about raising bottle babies or goats in general, we would be happy to have you out to the farm for our Goats 101 class, just send us a note with some times you are available for the class. Why are all of our does having kids this spring? 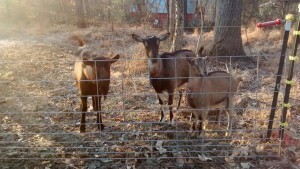 So we can have fresh, delicious, raw goats milk! We still have a few shares available for 2016, so if you are interested in learning more about our herd share program so you can get raw goat milk, send us a note! You can also read more about our herd share here.